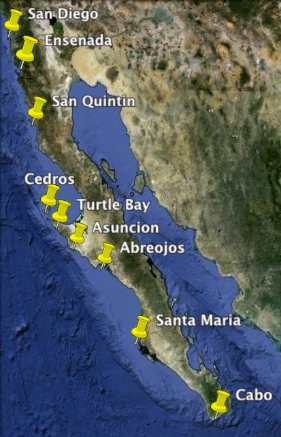 Anchorages between San Diego & Cabo. We sailed Mexico from 2010 to 2013, and our cruise began on the Pacific coast of Baja Mexico. 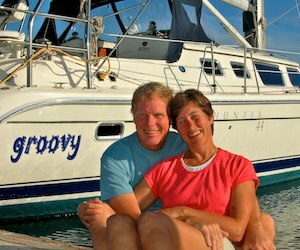 In the first half of 2010 we lived in our sailboat at Marina Coral & Hotel in Ensenada, Mexico, just 70 miles south of San Diego while we outfitted our boat for cruising. In the fall of 2010 we sailed down the Pacific coast of Baja Mexico to Cabo San Lucas. From there we jumped across the Sea of Cortez and began sailing Mexico’s mainland coast. In the winters of 2011-2013 we continued our Mexico sailing cruise along the coast, anchoring along the northern Pacific coast, the southern Pacific coast and venturing inland to see fabulous Mayan ruins, colonials cities and eco-tourism destinations while keeping our boat in marinas and at anchor in Chiapas, Huatulco and Zihuatanejo..
Mexico sailing is a blast, and the Pacific coast of Baja Mexico is often overlooked in cruisers’ enthusiasm to get south quick. Most of these posts are about our 6 month stay in Ensenada. To read about our voyage south from San Diego to Cabo, the true beginning of our tropical Mexico cruise 9 months later, start with this sailing blog post near the bottom of the list: Pacific Baja – A Voyage South. We have created nearly four hours of video describing the anchorages in Pacific Mexico and outlining the climate, weather patterns, navigational tactics and more, in our series “Cruising Mexico Off the Beaten Path” which is available as a DVD or video download at this link. The anchorages along the Pacific Coast of the Baja peninsula are described in the first video, “Ensenada and the Northern Pacific Coast,” along with strategies for getting south and what to do after you arrive in Cabo. The following list is all of our blog posts from the beginning and end of our sailing cruise of Mexico as we outfitted our boat in Ensenada, sailed south to Cabo San Lucas and did the Baja Bash north three years later. To locate the blog posts from the rest of our cruise (south to the Guatemala border and into the Sea of Cortez), see the MEXICO menu above or consult these links below. Ensenada – A Triumphant Homecoming! 09/23/13 July, 2013 – Our return to Ensenada in northern Baja at the end of our Mexico voyage was satisfying in ways we never anticipated. Baja Bash (2) – Chased by a Hurricane! 08/28/13 Our Baja Bash excitement continued as Hurricane Erick chased us out of Cabo and barked at us all the way to Ensenada. Baja Bash (1) – Sailing on the Coattails of a Hurricane! 08/08/13 July, 2013 – We started our Baja Bash in Puerto Vallarta by sailing on the coattails of Hurricane Dalila to Cabo San Lucas. Yikes! Cabo San Lucas – Way More Fun Than We Expected! 12/10/10 November, 2010 – After 17 days of sailing down the Baja peninsula, we arrived in Cabo just as the sun was rising – an ideal welcome! Ensenada Gentility (Riviera Cultural Center) and Craziness (Baja 500) 06/20/10 Ornate & dramatic, Ensenada’s Riviera Cultural Center hosts great concerts & Ensenada hosts the crazy and wild Baja 500 race. Ensenada’s Carnaval – One Wild Party! 02/28/10 February, 2010 – “Carnaval” is celebrated throughout Latin America, and the parades and parties in Ensenada, Mexico, are not to be missed!